How can I connect an SD card containing a Raspberry Pi OS to my Linux PC, and boot the OS in an emulator? Yes this is completely possible. However, in reality it's a little bit different to how you are thinking. The SD card contains an image of the operating system. And works by inflating this image when the device is powered on. As I expect you already know, you flash this image onto the SD card in order to create a working system. However, what you can do before you flash the image is have a play around with it using QEMU, which is a processor emulator, and allows us to emulate the ARM instruction set. In this way, any changes you make to the image (installing, compiling etc) will still be there after you flash it to the SD card. I'll now talk you through how to use QEMU to load the image. I will be demonstrating with the Arch Linux image, but the process should be the same regardless. You will need to acquire QEMU for your system. QEMU should only have one requirement, in order in input devices to work you need to have the SDL development package installed, which should be available from your package manager. We're working with Arch Linux, so will be using the Arch Arm image. But replace this with whatever you wish to work with, or perhaps you already have an image. In which case, skip this step. For QEMU to work we also need the kernel image (which would be inside the .img file). Note: I don't think this step is necessary for Debian. Someone please confirm. Luckily there are precompiled images available, and you can use the one from here (direct download). TODO: Demonstrate how to compile a kernel image here? An img file which you can verify using the supplied sha1 (recommended). Note that you will only have several hundred megabytes of storage using this method (whatever is spare on the image). A virtual hard disk can be created by following the QEMU user guide. You can then login on the terminal that shows on your host terminal. 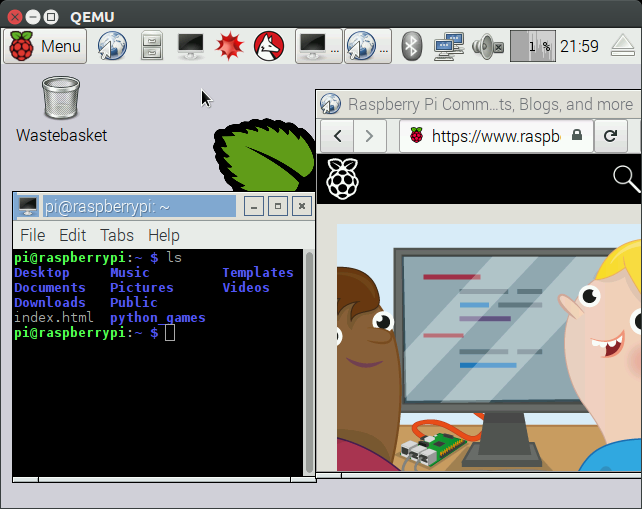 -M raspi2 was added in QEMU 2.6.0, and Ubuntu 16.04 only has QEMU 2.5.0, so we have to compile QEMU from source. But this is not hard. the GUI shows but is not responding to the mouse / keyboard, tested on both SDL and VNC. But CLI works perfectly however. So you might as well use the Lite image which has go GUI for now. This method uses -M versatilepb which is present on the QEMU 2.5.0 of Ubuntu 16.04. The downside is that you have to download a modified kernel (see Emulating with Qemu: why the extra kernel? ), and modify the image, so it is less representative of the real system. We pick 4.4.12 since that is the kernel version in the Raspbian image. Why this extra kernel image is needed: Emulating with Qemu: why the extra kernel? # Comment out the lines of type: "/dev/mmcblk*"
This goes to show how unstable -M raspi2 still is. You cannot do what you're suggesting, because Raspberry Pi has a different processor architecture than most PCs. While most PCs are x86-based, RPi is an ARM-based computer. This is the same reason as why you cannot run, for example, Microsoft Windows on RPi. VmWare won't work, because it can only virtualize x86-based operating systems (32-bit and 64-bit). There are other emulators that can virtualize ARM, such as QEMU, but those are running full software emulation without native CPU virtualizaton support, so you can expect them to be quite slow. 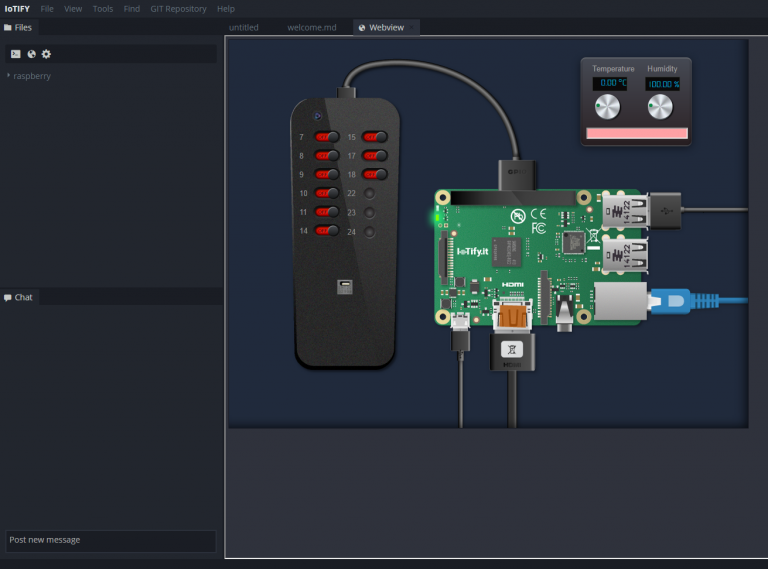 You could easily try a Raspberry Pi simulator included with sensor, command line and file editor at iotify.io. Check out our documentation at https://docs.iotify.io/ to get started with the different projects, OS and make yourself familiar with Raspberry Pi working environment. Not the answer you're looking for? Browse other questions tagged boot emulation linux or ask your own question. Is it possible to install Raspbmc without a wired internet connection? How does speed of QEMU emulation compare to a real Raspberry Pi board?